Socca Pizza with Pear, Brie, and Bacon is a delicious, gourmet way to enjoy gluten free pizza! Socca flatbread, or farinata, is layered with sweet pears, caramelized onions, crispy bacon, and creamy melted brie. My love affair with socca flatbread began with the The How Can It Be Gluten Free Cookbook . I use it all the time for quick gluten free pizzas, like this Socca Pizza with Pear, Brie, and Bacon. If you need more convincing, read my post on socca, and hopefully you will be a believer as well. With a great gluten free pizza base, you can go ahead and pile on toppings with confidence because you know you won’t be biting into something resembling cardboard. When we have pizza night at our house, I will make homemade pizza dough for the Ryan and the kids, and then use socca flatbread for myself. Unfortunately the kids get the most uninspired pizza toppings ever, and then I channel the rest of my energy into coming up with the most gourmet, legendary pizza ever for me. This Socca Pizza with Pear, Brie, and Bacon is what dreams are made of. I leave no taste sensation unturned with the sweetness of the pear and figs, creaminess of the brie, and the savoriness of the bacon and caramelized onions. Pizza night is a breeze using garbanzo bean (chickpea) flour. You can make a batch of farinata in minutes! Place cooked farinata on a piece of parchment paper and assemble toppings and cheese on top. Once the oven and stone are hot, place parchment with assembled socca pizza on top (I use a pizza peel to easily slide it on), and bake for 5-7 minutes. Alternatively, if you don’t have a pizza stone, the farinata pizza can be baked directly on the oven rack. Use a lower oven temperature of 425ºF. SAVE THIS SOCCA PIZZA TO YOUR PINTEREST BOARD! 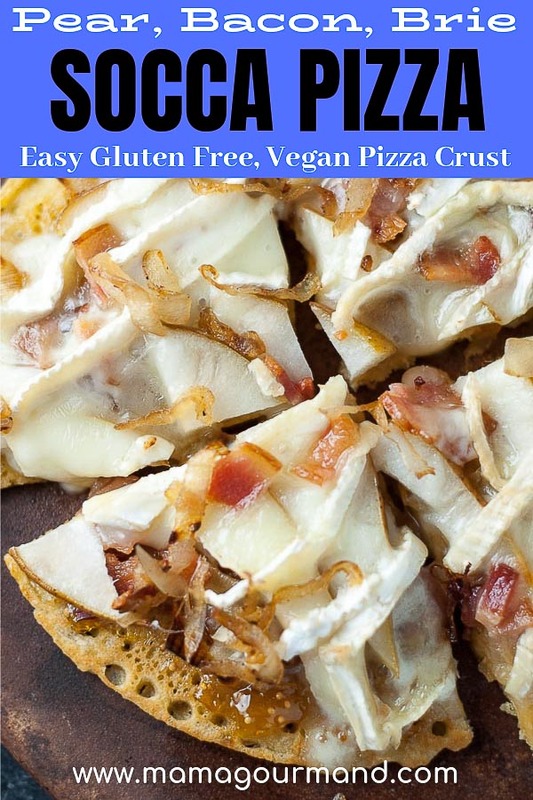 Enjoy gluten free pizza with Socca Pizza with Pear, Brie, and Bacon. 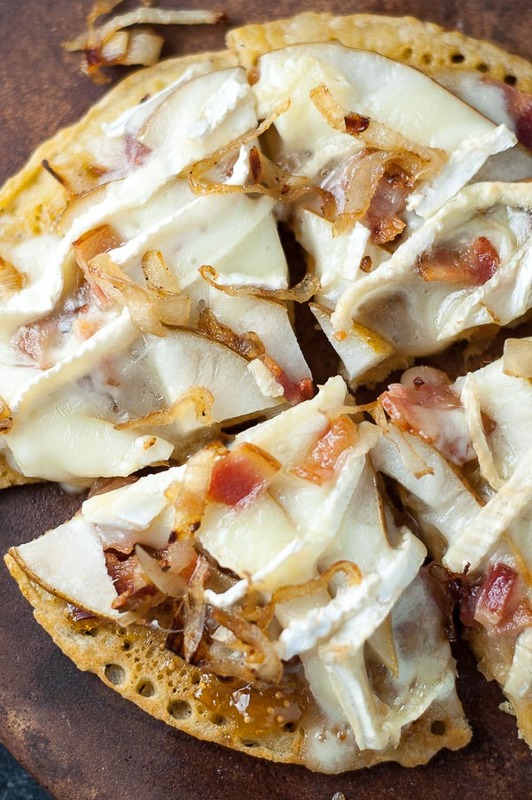 Socca flatbread, or farinata, is layered with pears, caramelized onions, bacon, & brie. Whisk chickpea flour, salt, and pepper together in a bowl. Whisk in water and 3 tablespoons olive oil until combined and smooth. The batter will be thin and runny. Heat 1 tablespoon olive oil in non-stick 8 inch skillet over medium heat until shimmering. Add 1/2 cup batter to the skillet, tilting pan to coat bottom evenly. Cook until crisp at edges and golden brown on bottom, about 2-3 minutes. Flip socca and continue to cook until second side is browned about 2 minutes more. Transfer to a wire rack to cool. Repeat with remaining batter and oil. Preheat oven to 425ºF. If you are using a pizza stone, place it in oven and preheat to 500ºF. Heat a tablespoon of olive oil in a large skillet over medium heat. Add the onions and season with salt and pepper. Stir and then cover pan with a lid to sweat and soften the onions for about 5 minutes, stirring occasionally. Remove the lid and continue sautéing the onions for about 15-20 minutes more, lowering heat if they are browning too quickly. During this step I usually add a pinch of sugar to help with the caramelization. Meanwhile, spread fig jam or olive oil over each socca flatbread. Layer with sliced pears, bacon crumbles, caramelized onions, and brie. WITHOUT PIZZA STONE: Place pizzas directly on oven rack and bake for about 5-7 minutes or until brie is melted. WITH PIZZA STONE: Place cooked socca on a piece of parchment paper and assemble toppings and cheese on top.